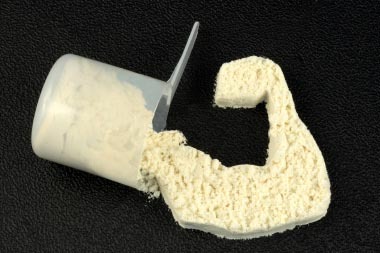 Whey has become almost synonymous with Body Building and Huge Muscles. It is impossible to miss the Mega-containers of Whey Protein at the Gym's store and you may have wondered what Whey could do for you, even if you are just working out at the Gym for Health and Fitness? The short answer is: Yes you can benefit and increase your fitness level with Whey supplementation. However, there is much more to know than the short answer, as the devil hides in the details. Whey is a natural product with a long history in Health and Beauty. It is not clear when it was first used, but we know that Hippocrates, 2,500 years ago used Whey liberally for its natural healing qualities particularly in the treatment of liver disease and gout. In Alpine Europe after WW 2, Whey was served fresh as a health beverage in special "Molke Kurhotels", and guest would go there for recovery after serious illness. But as the shelf-live of Whey is measured in hours, not months or years, the use of Whey was limited to close proximity to the source: the pasture roaming cows. To make Whey available to consumers everywhere, it had to be dried into a powder. That process resulted in a natural Whey product, which today is still available, albeit not where Body-Builders run their errands. Why? Because dried, unprocessed Whey contains only about 11% Protein (highly bio-available Albumin and Globulin) and 75% Carbohydrates in form of Lactose, plus abundant natural Vitamins, particularly B 2, alkaline Minerals, very little fat and therefore is low in calories.. It is known to stimulate digestion and repopulate intestinal flora and provide a noticeable energy boost. On top of all, Whey tastes naturally great! In order to convert this product into an Instant Muscle Generator, its Protein content had to be multiplied and the Carbohydrates minimized. The process to accomplish that is fairly simple and the industry is producing Whey concentrates and isolates with Protein contents of up to nearly 100%. But, of course, as always a gain on one side means a loss on the other, Whey is not different. So if you want all Protein, you sacrifice everything else and that means you are isolating the Protein; this means the Whey's natural balance is gone and with it, its innate health benefits. It is then not surprising that Whey isolates are connected with side effects including headache, loss of appetite, fatigue, swelling, cramps and even damage to the kidneys or the liver, the development of osteoporosis or allergic reactions. For this reason the producers usually mix Whey concentrates with Whey isolates, because the concentrates still have some of the original components. But, unfortunately the producers don't stop there; they add a multitude of adulterants for flavor enhancement, most of them toxic chemicals, many of which are hard to identify on the label, because they are disguised under benign terms like MSG in "Flavors". So unless your one and only interest is to build huge Muscles instantly, you want to avoid a pure Whey isolate product and choose a more balanced product with all the co-factors in tact. For example, if you are engaging in the currently taught Interval exercises, you can significantly increase your results of gaining Energy and Fat-burning, when you consume Protein within a half an hour of completion. Whey is an obvious choice and if you select a Natural Whey product without all the tagalongs like artificial flavors, you will enjoy the health benefits described above and then some. Thanx For ur post, i also read somewhere Whey Proteins are fundamental components of all living cells and include many substances, such as enzymes, hormones, and antibodies that are necessary for the proper functioning of a body are essential in the diet of humans for the growth and repair of tissue and can be obtained from foods such as meat, fish, eggs, milk, and legumes. i also read Whey Proteins are much usefull for muscle building. is this true..? ?